Civil engineers are highly trained professionals who plan public works projects and supervise their implementation. Most work in the private sector, but a good portion of them work in government. Their work is all around us. The infrastructure that moves people and commerce around the country was designed and implemented under the guidance of generations of civil engineers. Civil engineers design and supervise construction of major public works projects such as buildings, highways, airports, bridges, and dams. They can either work for a government organization or in private industry competing for government contracts. Since there are so many different types of projects a civil engineer can undertake, many of them specialize in a type of project or branch of the profession such as transportation engineering, structural engineering or geotechnical engineering. Much of the work is done in an office, but civil engineers also go to project sites to monitor construction. They ensure projects are going according to plan and answer any questions construction superintendents raise. From time to time, civil engineers speak about projects to governing boards and the general public. They also write documents about the project like responses to requests for proposals, status updates, and technical reports. Civil engineers in the private sector work closely with government contract managers. 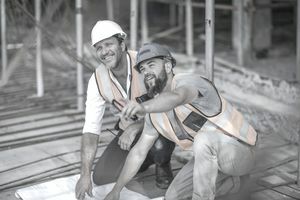 In addition to a college degree in civil engineering or one of its specialties, civil engineers who sign off on project plans or supervise other civil engineers must be licensed according to rules enacted by state governments. Licensing processes include several exams and require years of work experience. In the end, licensed civil engineers earn the designation of a professional engineer (or PE). Civil engineering requires a broad skill set. One of the most critical elements to succeeding is project management. Some plans can be drawn in relative isolation, but bringing plans to life requires a team, and a civil engineer is the leader of such a team. Where team members’ individual work meets with that of others, the civil engineer makes sure it all fits together. All the skills that must be brought to any project must be applied to public works projects. Civil engineers hold others accountable while ensuring a public works project is completed on time, on budget and up to quality expectations. Civil engineers are good problem solvers. When documented plans do not match reality, civil engineers devise solutions that keep within a project’s framework. They answer questions about the project when those executing parts of the project need clarification. Proficiency in advanced mathematics is essential to civil engineering. Geometry and calculus are obvious necessities. Of course, computer programs can solve equations in a matter of milliseconds, but civil engineers must know what those figures mean and apply them to plans. People outside the core group working on a public works project do not understand these mathematical areas to the extent civil engineers do, but those who make decisions about a public works project’s direction understand business math. Civil engineers provide cost estimates and devise budgets. They need buy-in from decision makers on the money side of things so they can actually put their geometry and calculus skills to productive use. Projects often have many governmental entities involved. Work on an interstate highway could involve entities in federal, state and local governments. On some projects, more than one government organization provides financial support. Elected officials and public administrators pay more attention to projects they back financially than to those merely happening in their geographical proximity. For instance, a city council is aware of road projects in the county, but it is involved in road projects within the city limits. According to 2010 data from the US Bureau of Labor Statistics, most civil engineers work in the private sector. Firms employing civil engineers compete for government contracts to design, build or repair public works projects. A sizable portion of civil engineers work in the various levels of government: 13% in state government, 11% in local government and 5% in federal government. These civil engineers do the same work as those in the private sector, but they do not have to compete for business. They compete for jobs through the government hiring process. The numbers fluctuate, but civil engineers earn approximately an average salary of $77,560. The top 10% of earners make more than $119,320. The bottom 10% make less than $50,560. Of all the places a civil engineer can work, the most lucrative is the federal government -- at least in the aggregate. The average salary for a civil engineer in the federal government is $89,450. The average salary for civil engineers in local government beats the profession’s average by a little. They earn $80,250 on average. The average salary for civil engineers in state government is $74,300. What Is It Like to Be a City Finance Director?